The following are excerpts from the introduction to the book NUCLEAR WEAPONS: AN ABSOLUTE EVIL that can be downloaded here. Today, because of the possibility that U.S. President Donald Trump might initiate a nuclear war against Iran or North Korea, or even Russia, the issue of nuclear weapons is at the center of the global stage. I strongly believe that the time has come for all countries to take a united stance on this issue. Most of the world’s nations live in nuclear weapon free zones (NWFZs). This does not give them any real protection, since the catastrophic environmental effects of nuclear war would be global, not sparing any nation. 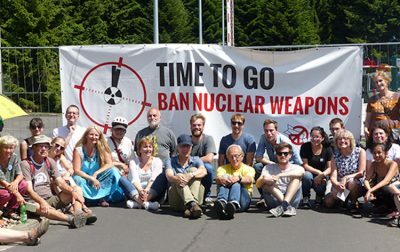 However, by supporting the Nuclear Weapons Convention and by becoming members of NWFZ’s, nations can state that they consider nuclear weapons to be morally unacceptable, a view that must soon become worldwide if human civilization is to survive. We must take a stand, and state clearly that nuclear weapons are an absolute evil; that their possession does not increase anyone’s security; that their continued existence is a threat to the life of every person on the planet; and that these genocidal and potentially omnicidal weapons have no place in a civilized society. Cannot nuclear warfare be seen as an example of genocide? It is capable of killing entire populations, including babies, young children, and adults in their prime and old people, without any regard for guilt or innocence. The retention of nuclear weapons, with the intent to use them under some circumstances, must be seen as the intent to commit genocide. Is it not morally degrading to see our leaders announce their intention to commit the “crime of crimes” in our names? War was always madness, always immoral, always the cause of unspeakable suffering, economic waste and widespread destruction, and always a source of poverty, hate, barbarism and endless cycles of revenge and counter-revenge. It has always been a crime for soldiers to kill people, just as it is a crime for murderers in civil society to kill people. No flag has ever been wide enough to cover up atrocities. But today, the development of all-destroying modern weapons has put war completely beyond the bounds of sanity and elementary humanity. Today, war is not only insane, but also a violation of international law. Both the United Nations Charter and the Nuremberg Principles make it a crime to launch an aggressive war. According to the Nuremberg Principles, every soldier is responsible for the crimes that he or she commits, even while acting under the orders of a superior officer. The only possible exception to this general rule might be “an extreme circumstance of self-defense, in which the very survival of a state would be at stake”. But the Court refused to say that even in this extreme circumstance the threat or use of nuclear weapons would be legal. It left the exceptional case undecided. Can we not rid ourselves of both nuclear weapons and the institution of war itself? We must act quickly and resolutely before everything that we love in our beautiful world is reduced to radioactive ashes. John Scales Avery is a theoretical chemist noted for his research publications in quantum chemistry, thermodynamics, evolution, and history of science. Presently an Associate Professor in quantum chemistry at the University of Copenhagen,since the early 1990s, he has been an active World peace activist. During these years, he was part of a group associated with the Pugwash Conferences on Science and World Affairs, which in 1995 received the Nobel Peace Prize. Featured image is from IPPNW.